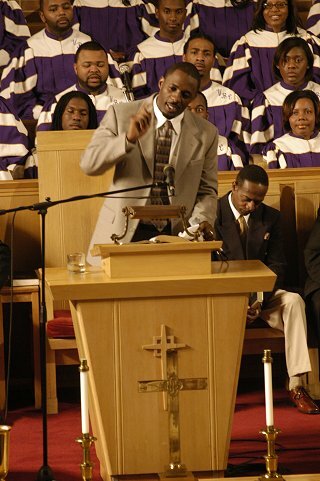 While Elba's first post-The Wire film role is about as polar opposite from that of his star-making character--that of Atlanta megachurch reverend Charles Frank--the execution ended up playing out not too differently than what took place on that series. His character is not the focus of Rob Hardy's inspirational drama (that would be Boris Kodjoe's character), but so forceful is his charisma and performance that while he does not have the majority of screen time, he (and, for that matter, his on-screen wife, Nona Gaye) has the lion's share of audience interest and involvement. It is appropriate that his character is a preacher, for much like the congregation the viewer is easily captivated and convinced by his words. But while Hardy's film may be on the whole a fairly straightforward faith-based film, Elba's portrayal of Charles is hardly that: a complex and compelling portrait of a well-meaning man wrestling to reconcile the self-serving benefits of his mega-church ambitions with their truer, greater, selfless, underlying intent to better and more faithfully serve God. But beyond his performance, the film marks Elba's first collaboration with Rainforest Films, a relationship that will bear cinematic fruit of grander, greater scale in the years to follow, portending his ability at establishing lasting artistic relationships with sympatico filmmakers.